From Baskets to tee sign to other options, make sure you are getting the right equipment for you course project. One of our course development experts will reach out to you to make sure you have all the right equipment and accessories to make your course a success. With our inustry leading warrenty, superior quality, and trusted performance, you will have the peace of mind that you have made the right decision for your course to keep the players coming back for more. The DGA Mach 2 is the perfect solution for the entry level course. If you are adding a course to your school, summer camp or simply introducing the sport to your area, the Mach 2 is the right solution for you. Classic & iconic, the Mach III comes with circular number plate. The Mach III has been installed on more courses over the years than any other basket on the market. This proven winner is always a solid choice. The Mach 5 is a top choice for its high performance & great price. The Mach 5 is a disc golf target that you can’t go wrong with. If you are on a budget but don’t want to sacrifice quality and performance look no further than this trusty target. The Mach 7 is the best option for visibility & performance. The Mach 7 combines an innovative visibility ring that is protected from disc hits with unequalled catching performance. Turn heads and utilize the latest in basket technology with the Mach 7. The Mach X is the ultimate target for championship rated courses. Mach X’s innovative chain design means one thing, the Mach X will stop anything you can throw at it. Become an instant legend to your players and install Mach X baskets. Mach Shift is the perfect basket for putting practice. Are you looking to perfect your putting game? The Mach Shift is the right choice for you. The innovative 3-in-1 basket design allows you to adjust your catching area to focus in your putts. Mach Lite is the perfect basket for on the go. Are you looking to take your disc golf game with you, the Mach Lite, with it’s innovative collapsible functionality, will allow you to bring the game to the beach, park or wherever you may travel. Mach 2 is the perfect choice for an entry level course….or your backyard. If you want the construction and durability of disc golf course level baskets, but are on a budget, the Mach II fits the bill. Feel like you’re putting on the course from the comfort of your backyard. DGA Portable Baskets Are Ideal For Schools, Camps, The Backyard, Or On The Go. 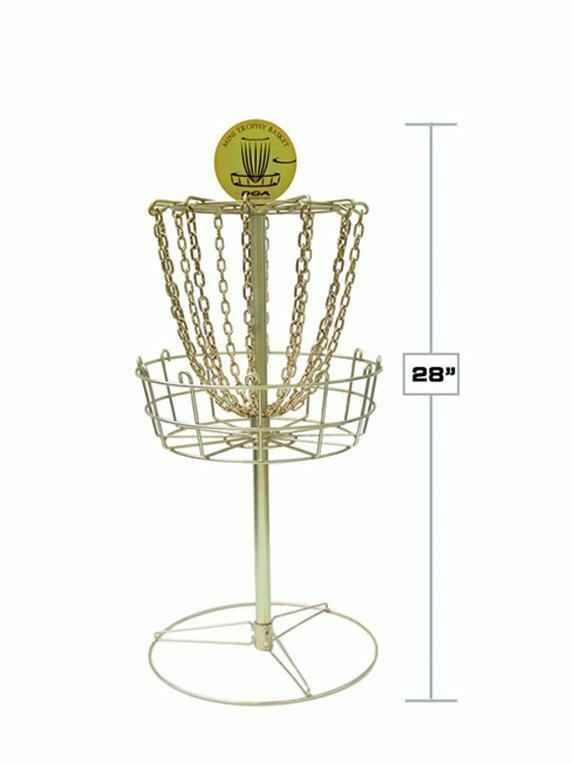 Looking for a mini Basket for mini disc golf or a tournament trophy prize? What is a Disc Golf Basket or Target? 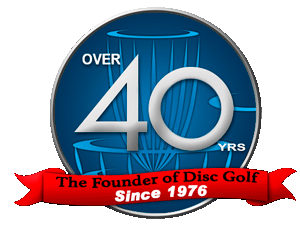 DGA invented the first disc golf basket over 40 years ago in 1975 as one of the first steps the company took to formalize the sport and game of disc golf. The term disc golf basket, or "Basket" is one of the most common informal names for what originally was known as a Disc Pole Hole. The Disc Pole Hole is also referred to as a cage, pin, hole, target, disc catcher, goal, chains, bucket, and pole. A disc golf basket is made up of a chain holder attached to the top of a pole. The pole is often cemented directly into the ground. The chain holder has chains attached to it that surrounds the pole and hangs down towards a basket. The basket is attached about halfway down the pole below the chain. A disc golf course is generally made up of at least 9 disc golf baskets, however, most courses are built with 18 disc golf baskets. (Space permitting, there are also course designs up to 21, 24, and 27 holes.) Disc golf baskets must conform to specific dimensions if they are to be used in PDGA sanctioned tournament play. Disc golf baskets are the main and most important components of a disc golf course. Disc golf baskets serve the same function as golf holes do in the sport of traditional golf. When a thrown flying disc hits the chains and drops into the basket, the hole is complete. A player's score is added up by counting the number of throws it takes for the disc to come to rest in the basket. 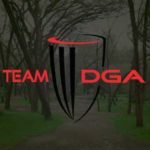 DGA currently manufactures 7 disc golf basket models conforming to different PDGA specification for both tournament play as well as recreational use. There are two categories of DGA baskets, Permanent and Practice/Portable. Permanent disc golf baskets are heavy-duty and are designed for outdoor park and recreation settings. In these settings disc golf baskets get constant play (banging of the chains) and abuse. Permanent disc golf baskets have anywhere from 18 to 40 strands of chain and are durable enough to withstand sun, wind, rain, and snow. Each disc golf target is hot-dipped galvanized from head to toe (a DGA standard). DGA disc golf baskets can be powder coated in different colors if desired. locked into anchors that are cemented into the ground. This allows for a permanent but movable installation. DGA portable and practice disc golf baskets (Mach Lite and Mach Shift specifically) are lighter weight and lighter duty than DGA permanent disc golf baskets. DGA practice disc golf baskets are designed to be easily portable. These baskets have 16 strands of chain to reduce weight and increase ease of mobility. DGA practice baskets are not designed to be left outdoors but to be properly stored when not in use. The Mach Lite can fold in on itself like an umbrella and comes with a shoulder bag for easy storage and transport. The Mach Shift basket is an all metal basket that snaps together with spring-loaded buttons. DGA is committed to quality and has specialized in manufacturing Disc Pole Holes for over 40 years. You don’t want your investment to rust or weather quickly and you want a company that will stand behind their products. DGA uses industrial strength manufacturing and hot-dipped galvanizing methods which we have refined over the decades. To ensure ultimate corrosion protection and visibility, DGA color powder coated disc golf baskets are hot-dipped galvanized first to make sure they have long-lasting weather protection. DGA produces the highest quality and longest lasting disc golf equipment that offers the greatest value. Each DGA permanent style Mach Series disc golf basket is hand inspected for quality and most have a 25 Year Limited Warranty to make sure your investment stands the test of time. Today more people know what disc golf baskets are when they see them in the park. 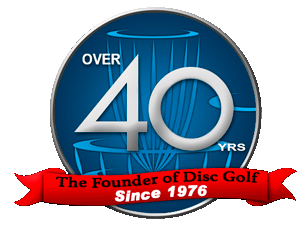 In 1975 when DGA first unveiled the first Disc Pole Hole to the Frisbee® community, it was a revolutionary breakthrough. 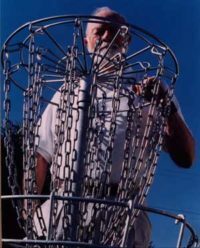 Ed Headrick started DGA with his son Ken to work on the first disc golf basket. When they began, people were throwing Frisbees at light poles, trash cans, signs, and even trees. DGA’s first Disc Pole Hole consisted of 10 chains hanging in a parabolic shape over an upward opening basket (US Patent 4,039,189, issued 1975). Ed had tried many prototypes before having the idea of hanging chains over a basket. The archives of DGA are full of pictures of fishing net contraptions, welded boxes of rings on poles and other sketches hatched out of Headrick’s imagination. Since DGA’s founding, there have been many attempts to improve upon the Disc Pole Hole’s basic design. However, just as the basic design of the bicycle has lasted the test of time, the basic design of the first Disc Pole Hole from 1975 is still the foundation of every basket today. Over the years DGA has come out with many inventions and patents improving upon the original design. These inventions include multiple rows of chain (inner chains), sliding attachment points for the chain (sliding links), the Trapper Basket, and most recently the V reflex chain configuration found on the Mach Lite and Mach X.
DGA can help you get your course in the ground quickly and easily. To order DGA baskets please fill out a quote request using our Quote Form page or call DGA directly, (Phone Number: 831-722-6037). If you are just curious about the cost of general course equipment, please look at our Sample Courses page where we have a selection of sample course packages and pricing available for consideration and review to fit your specific budget requirements. Make sure to also ask about DGA golf discs when ordering. DGA offers the highest quality discs and can offer a full choice of options for your school, your course, or pro shop.